The embattled Member of Parliament for Ruhinda County in Mitooma District and Justice minister Kahinda Otafiire’s tormentor Dononzio Kahonda has been granted bail by the Jinja High Court today morning. However the legislator has to remain in prison until Tuesday when he will be expected to get another bail in the Luwero Magistrate’s Court where he was charged with fresh but similar charges on Friday. Mr Kahonda was on Friday picked from Kirinya Prison and produced before the Luweero Chief Magistrate Charles Sserubuga and charged with two fresh counts of forgery and uttering false documents. Prosecution alleges that Kahonda forged an Ordinary level (O-level) and Advanced Level (A-level) Certificate of Education which were presented to Ndejje University for admission. Jinja High Court presided over by judge Eva Luswata granted MP Kahonda a non-cash bail of UGX100 million. Kahonda was last month sentenced to nine months in jail after he was found guilty of 11 charges of impersonation, forgery and uttering false documents last month. He appealed the sentence and accordingly applied for bail pending the hearing of the appeal. The charges stemmed from allegations that he uttered a Uganda Certificate of Education (UCE) to UNEB in which he claimed to be Dickson Mutabazi yet he is not. 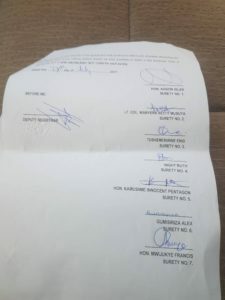 He was also accused of forging a medical report at the UPDF Military Academy in Jinja in the same name and purported that the same document was genuine whereas not. The MP argued that the lower court convicted him of various counts of impersonation, forgery and uttering false documents without establishing the ingredients of the said offenses. He also cited political interference in the case by his political nemesis Otafiire. But Mr Caleb Mwesigwa, one of Kahonda’s lawyers, said the charges against his client are aimed at sweeping him off the political scene by keeping him in detention. 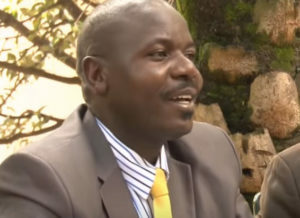 Kahonda defeated Justice minister Kahinda Otafiire both in National Resistance Movement party primaries and later in the Ruhinda County Parliamentary elections. He garnered 21,467 votes against Otafiire’s 12,949, defeating the minister in all the nine sub-counties of Ruhinda Central in the February 2016 elections.